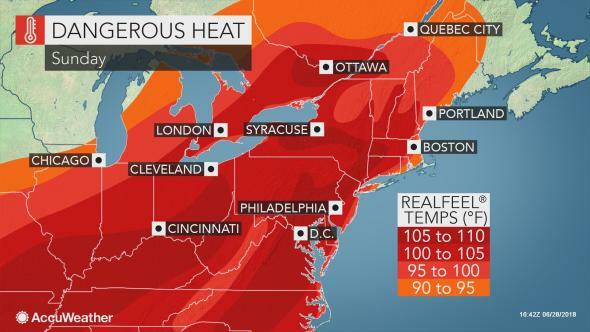 The National Weather Service in Upton has issued a Heat Advisory, which is in effect from noon to 9 PM EDT Saturday. * HEAT INDEX VALUES …In the upper 90s. Heat index values will be at least a few degrees higher on Sunday. * TIMING …Highest heat indices in the mid to late afternoon. 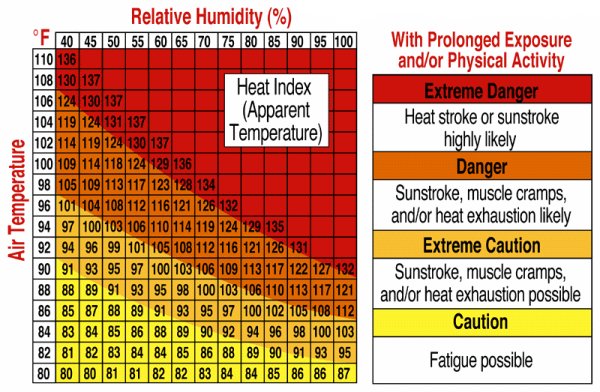 I immediately went to a site that gave me more specifics in terms of combining heat and humidity to provide me with the “heat index” mentioned above. Figure 1 shows this conversion, followed by definitions that translate the warnings into more specific terms. The warning focused on Friday and Saturday and hinted that Sunday would be worse. Further searching made it clear that this weather was not confined to NYC. Figure 2 shows the weather projections over the Eastern parts of US and Canada and the map is almost solid red. The study noted that some of the hottest parts of the region are getting hotter, faster. From 1950 to 2010, for example, western Afghanistan and southwestern Pakistan have already seen average temperatures rise in the range of 1 degree Celsius to 3 degrees per year. The intensity of outcomes vary depending on future measures to reduce greenhouse gas emissions. For instance, across South Asia annual average temperatures are projected to rise by 2.2 degrees Celsius (3.9 degrees Fahrenheit) by 2050 under a high emissions scenario, and by 1.6 degrees Celsius if steps are taken to reduce global emissions. Half a planet away the situation is similar, with hundreds of millions of people subjected to equal miseries but they lack the resources to protect themselves with air conditioning and other comforts that many of us here have at our disposal. Friday evening I had plans in the city. I took the subway, which was air-conditioned and comfortable, as was the theater that I visited. On Sunday I had a family engagement in the suburbs. My family has a small swimming pool that we were invited to share. That was great while you were in the pool itself but getting in and out, walking on the concrete floor was impossible. Driving to and from the suburbs in an air-conditioned car was a pleasure. The car’s external thermometer recorded an outside temperature around 102oF (39oC) both ways. Back home, my apartment has a thermometer that records outside temperature. During the last 4 days it floated between the upper 90s (F) and lower 100s. I had no way to directly measure the outside humidity aside from knowing it was high but Figure 1 tells me that the heat index was around 110o. I grew up in Israel so I am used to high temperatures and humidity. This was not a big deal for me because I am well equipped to handle it, unlike many people in NYC or even more around the world. Such people can become desperate, sick, or even die. Leaving climate change on its current trajectory will make life for all of us much more uncomfortable and dangerous. The impact on wine will wait for next week. This entry was posted in Anthropocene, Anthropogenic, Climate Change, Sustainability and tagged Adaptation, advisory, Afghanistan, air conditioner, air conditioning, Anthropocene, Anthropogenic, Clean Energy, Climate Change, Climate Change Denial, Climate Change Deniers, Climate Skeptics, CO2 emissions, danger, dangerous, Emissions, Energy, energy transition, Environment, excessive heat, Extreme Weather, Fossil Fuels, Future, Global Warming, greenhouse gas, heat, heat advisory, Heat Exhaustion, heat index, Heat Stroke, heat wave, humid, humidity, Israel, Mitigation, Nepal, NOAA, Pakistan, Science, South Asia, summer, sunstroke, Sustainability, Temperature, thermometer, US, Warning, Weather, World Bank. Bookmark the permalink.